The ABCs and WTFs of pumpkin beer. I got my first taste of pumpkin beer back in 1999, at Colorado's Great American Beer Festival. It came from an Indiana brewery whose name I've long since forgotten. But it was one of the first things I ever had that demonstrated that beer could be more than just a traditional amber ale, pilsner or stout. It convinced me that I was actually drinking pumpkin pie, and for that I will always be grateful—not because I'm such a huge fan of pumpkin pie, but because it opened my eyes to a bigger beer world. During the season when everything has pumpkin spice in it, you owe it to yourself to find the best of what's out there. 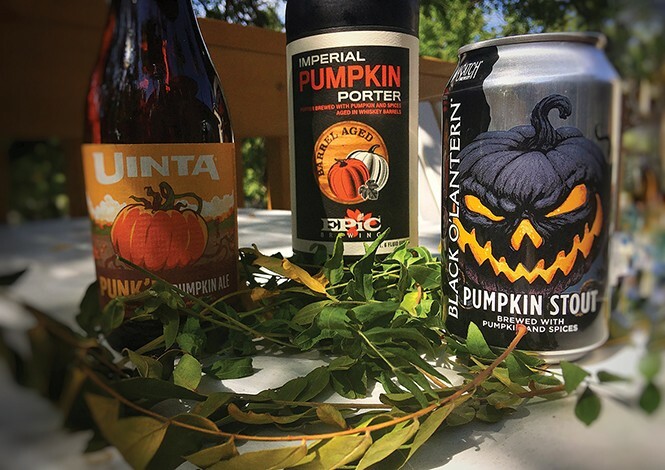 My expertise is beer, and I've found three local examples of pumpkin brews that are far more than a gimmick. Epic Imperial Pumpkin Porter: Served in a bulbous snifter, this unique creation has a nice pitch color with very little head. The nose is amazing: Chocolate, coffee, vanilla and a good dose of pumpkin pie spices. The first sip hints at bourbon and chocolate, which is present throughout. Then the pumpkin pie becomes more pronounced. There are notes of yellow cake and dark candied fruits, as well. Toward the end, coffee flavors start to emerge, giving the sweeter aspects of the malt something to balance with. As it warms, the bourbon becomes stronger, making it extra rich as it finishes with just a hint of that warming booze. Overall: This one is something special. It's far more complex than Epic's standard Imperial Pumpkin Porter, though IPP is still in there. This is probably the pumpkin beer that pumpkin beer haters will clamor for this year. Uinta Punk'n Pumpkin Ale: From a draft handle at the Uinta Brewing, this one pours a brilliantly clear amber color with a fluffy, oily looking head. As I get my nose on top of the foam, there's toasted bread and malt, with hints of brown sugar and molasses that give way to nutmeg and cloves. As I swig, the pumpkin flavor is not overly strong, but it is pleasant. I like that this ale now has real pumpkin, and not just pumpkin pie spice. The malts are sweet and round, which keeps the spices from being drying; the end is rounded out with a slight smack of hops. The finish is smooth and frothy. Overall: This no-frills pumpkin ale delivers everything promised on the packaging. A pretty solid take on the concept. Wasatch Black O'Lantern Pumpkin Stout: It pours black with one finger of tan head that settles into a thin creamy layer. The nose has a spicy and roasty malt aroma, with a good dose of cinnamon, nutmeg and cloves along with dark roast. The taste starts off much like the nose: There's a spicy and roasty dark malt-driven quality, with notes of those pumpkin spices. Dark roasted barley malt comes next, adding notes of cocoa, coffee, toast and a bit of smoke. Caramelized sugars round out the finish with light hops as a finale. Overall: This beer is a marriage between Squatters' Outer Darkness Imperial Stout and Wasatch's Pumpkin Ale. The two create a solid combo of a stout and pumpkin ale. Let it warm up a bit for the full flavor explosion to come through. Between lattes and candles, you're probably already into fall spice overload. These three beers, however, will be worth your pumpkin pie dollars. As always, cheers!